I got this on craigslist on Friday. It's in bad mechanical shape. The brifters might be dead. I'll bathe them in WD40 to see. The right crank might be bent. It has a 7-speed cassette. I only test rode it in a parking lot. It seemed to offer a nice solid and stable ride. I bought the bike for the parts. I hope I don't fall in love with the frame. It does happen to fit me perfectly. I mean, I didn't even have to move the seat. It's at the perfect height for me. And the seat is a nice surprise. My doctor prescribed one of these cutout seats for me. I have to take pressure off my perineum. And I have to talk about my tush to satisfy RFC's image of me. I say fix it up and use it in place of the bike you lost. I owned one of those (maybe a model year or two later than yours). Very nice bike for touring and commuting. Here's a picture up on the old mission north of Traverse City MI. Ended up selling it when I quick doing tours. Definitely give it a try before parting it out. That's kind of the idea. I have a Raleigh International frameset. 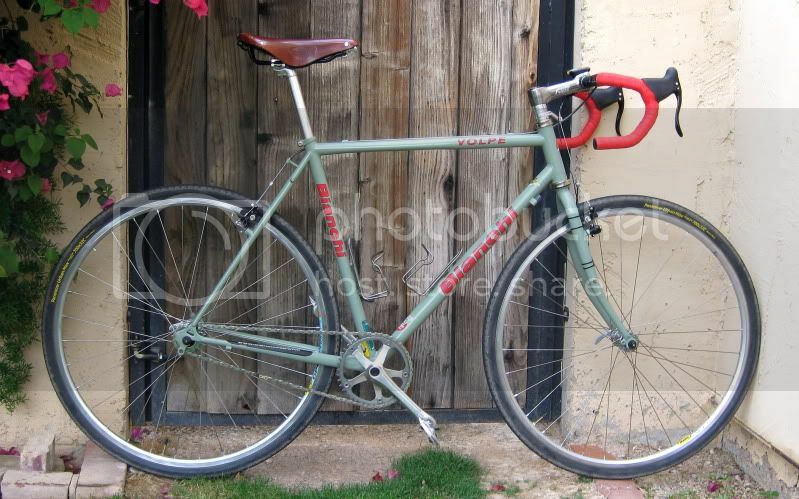 It should be a pretty light bike for a steel frame, lighter than this Bianchi. Traverse City, huh? That's where my daughter's girlfriend is from. My daughter is trying to figure out how to get there for Christmas break. They go to college in Washington State. I don’t scour the countryside anymore, the way I once would, for vintage road bikes. But, I still have a short list of bike frames that I would jump on if ever they came across my path. The Volpe is near the top of my list of bike frames that I would consider extremely versatile from road to cross to sport/tourer. I’m guessing it’s a 56/57 cm which I would have thought a little small for you. I thought you were a really tall guy. If you do part it out, I would like to add my name to what will surely be a long list of people who would like to buy the frame from you. Good luck with her Noglider. I was lucky enough to pick up a Bianchi Volpe a couple of years ago. 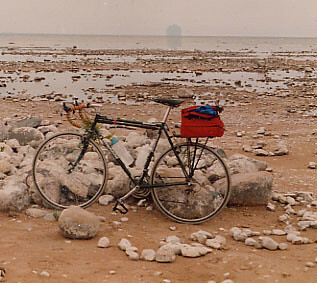 I spent the summer riding it around the highways near my summer cottage on Loon Lake. The bike was just great for that purpose. Definitely versatile! I've had my Volpe since I got it new in '90-91. It's done a bit of everything, including commuting, utility riding, a few centuries, and a season of cross racing. I just put fenders and road tires back on mine last week. Tom - great choice, and a worthy replacement (I'd say upgrade) on the Surly. My understanding is that 8 sp STI can be fixed - 9 and 10, not so much. I'd repair the STI if I could...otherwise I'd go another (cheaper) route. Wow, that's high praise. What is it about the Volpe that you like so much? And what's your size? It has weird pseudo-lugs. What's that all about? It is a 56cm frame, which is my ideal size. Funny that on the net, people think I'm taller than I am. I'm between 5'9" and 5'10" with very short legs, so I take a small bike. I'm comfortable on a bike anywhere between 21" and 23" (54 to 58 cm). I often ride the smallest bike among my friends, even though I'm not the shortest person standing up. Often, I am the tallest person sitting down, since my torso is so long. Aaron, I hope I can revive these brifters. If not, I have a pair of Sora shifters. Not sure whether they're 7, 8, or 9 speed. I know Sora are bottom of the line, but if they work, they work, right? I paid only $140 for the whole bike, so I can justify doing anything with it. SORA, Tiagra, 105 - it's for a commuter. Who cares. It'll be an awesome all 'rounder, that's for sure. I tossed 105 on my Koga - I don't care for the front trim, but that would be the case on the other gruppos too. It works great. No, Aaron, I'm thinking of moving part or all of the drivetrain to my Raleigh International, if I ever manage to paint it. Would that be disappointing? I probably wouldn't cold set the International...but that's me. It's a totally valid choice and for you (Mr. Skinny), an International might make a great deal of sense. Either way, you're gonna have a cool bike! Chris, as I often say, it's a time/money tradeoff. I have a lot of patience, so I wait for the good deals. That's how I got this. I wasn't even looking for anything like it. I was looking for a parts donor bike. The bad thing is that the most important thing was a pair of shifters, either bar end or brifters. And these may prove to be bad. But I guess even if they're bad, I got my money's worth in the other parts of the bike. I have a lot of patience, so I wait for the good deals. That's how I got this. Velognome, remember, I'm famous around my town. Someone just GAVE me that Matsuri, because she wanted it out of her house. A friend of mine who is also here on BF pointed this out to me. The asking price was $175. Since the guy didn't hesitate to accept $140, I might have been able to pay even less. But I did fine, and so did he. If not in the hands of a good mechanic, it would be a bad bike, so he couldn't have (or shouldn't have) sold it for more. I would keep that bike just like it is and just do the minor repairs/upgrades. It is a terrific bike for all sorts of purposes. You could probably find another parts bike for the International. Great find! I'm glad you got something to replace the stolen CC. Nice bike! I think the 8-speed brifters are more responsive to the WD40 treatment. Otherwise, I think it's a spring that needs replacing, and was informed they are available. A guy on Facebook makes a living refurbing them. BTW, if you get this one stolen from your porch, the next time I'm in NYC, I'll personally head over to the Garden State and hit you over the head with my panniers! Yeah, the funny thing is, it might ride better than the Surly. The Surly was disappointingly heavy. It is a 56cm frame,taller than I am. I'm between 5'9" and 5'10" with very short legs, . I don’t know what the pseudo-lugs are all about, but my praise was more about the geometry, braze-ons for racks or fenders, and brake bosses for cantis. I’ve been known to try and stretch the boundaries on what a bike was really designed for. The Volpe is one of a rather small group of frames that allow for a wide range of builds. Off the top of my head I can only think of a few other frames that are as universal, Masi makes one that I forget what it is called, Soma and Surly make cross frames that would work, I think the ‘King of Mercia’ by Mercian is one, the Miyata 610 and the Miyatas later variants of a sport/tourer among others. I have the opposite problem as you; I’m 6’ but am mostly legs so I’ve ended up with bikes that are supposed to be too big for me. I'm with you on this. The Volpe is too nice to cannibalize for parts and as a cross bike is an excellent vintage equivalent for the lost Cross-check. I'd go as far as to say it was a karma gift/replacement. I'd look for a bike with a tweaked frame to cannibalize for the International. Keep it as is and ride it for whatever purpose you want. That bike will take you everywhere and do nearly everything other than fast race type riding, and you have the McClean (sp.?) for that. Use your patience to get another parts bike for the International. Maybe the Volpe can be your rain/bad weather bike.